29, Lets Go! Scenario 2. Delaying Action at Arthenay. Dan and I continued the 29, Lets Go! 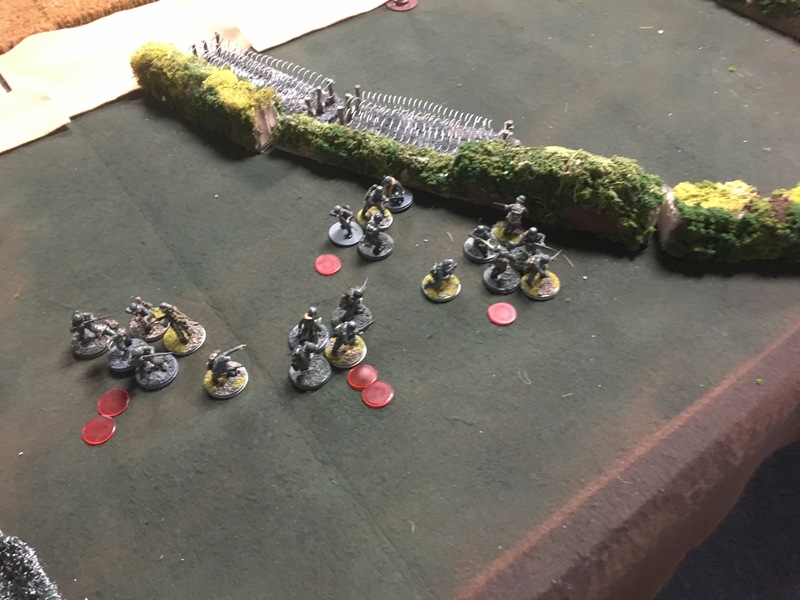 campaign with scenario 2, a delaying action at Arthenay. Our first game was a 4 player version of the Probe into La Cambe. Both Dan and Matt wrote up nice AARs of it on their blogs. 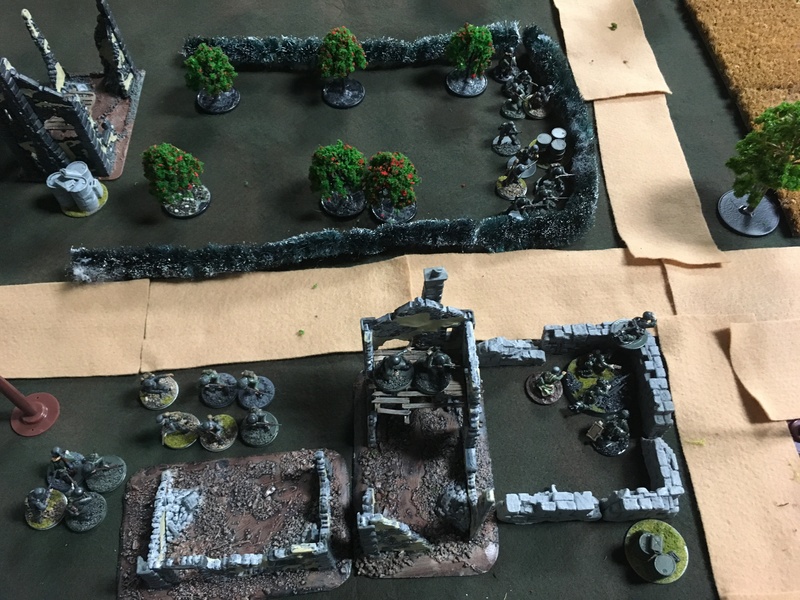 I was an American player in the first scenario and my flank bogged down as two squads got caught out in the open after trying to exploit a double activation. 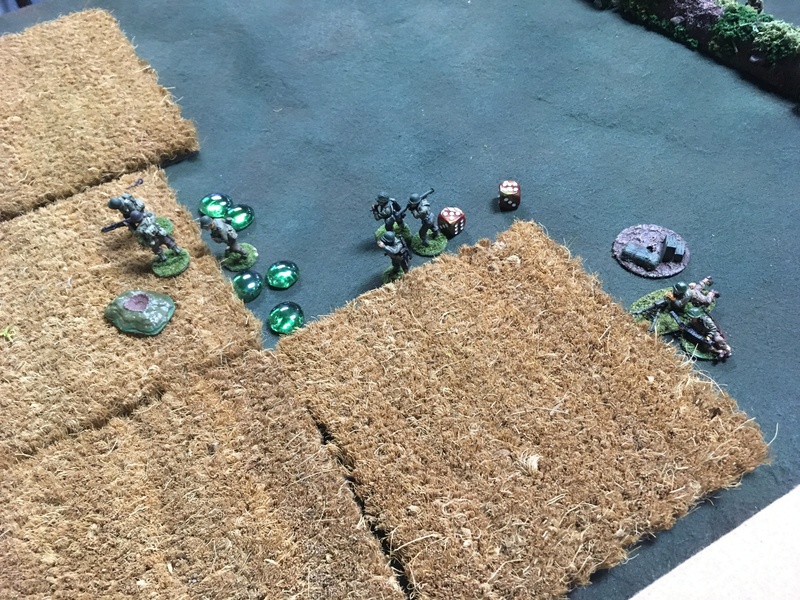 I hopped over a hedge after rolling two sixes, counting on rushing forward and laying down some close range fire on the second activation. Unfortunately the next toss of the dice didn’t allow me to do anything with those squads. They got caught in the open and torn up over the course of a couple of German activations. The two Shermans that charged up the road to reinforce them got ambushed by a panzerschreck team and an off board 88 laying in ambush. It was getting late and we had to call the game. 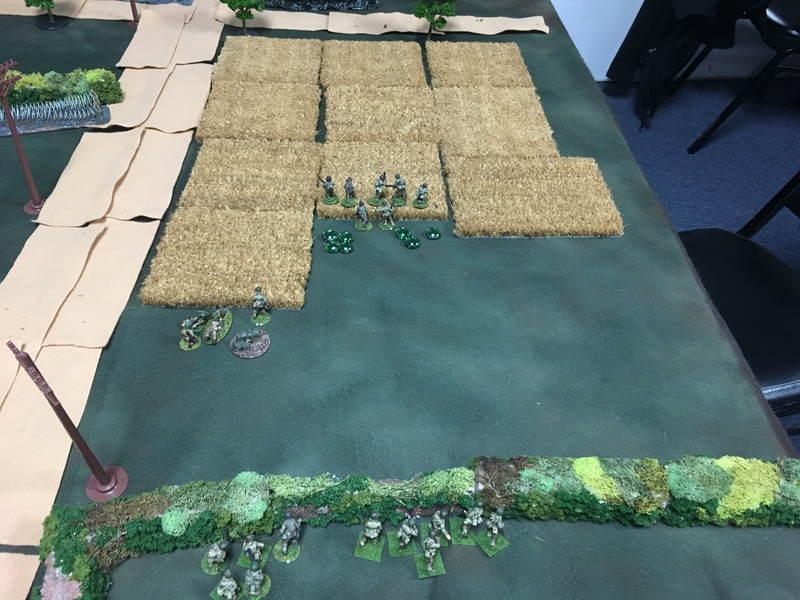 The Americans started with 11 force moral and I believe we were down to 6 at about 10:30 with my platoon pretty much combat in-effective and the two Shermans knocked out we all felt it was just a matter of mopping up the remaining units and we called it as a German victory. The Americans withdrew and called in artillery and leveled the farm (we didn’t feel like replaying the scenario). Dan and I met to play the second scenario. Dan brought his Americans and I fielded the German side this time. Setting up the table as it is pictured in the campaign book leaves a lot of open field for the Americans to charge across. I was looking forward to the MG42 getting a work out. 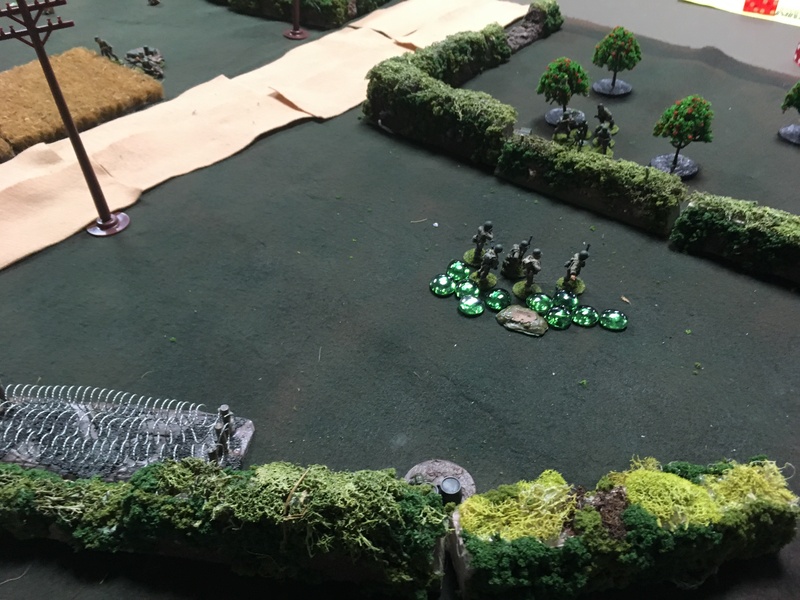 We played out the Patrol Phase and decided that the fields counted as light cover, so a jump off point could be deployed there. 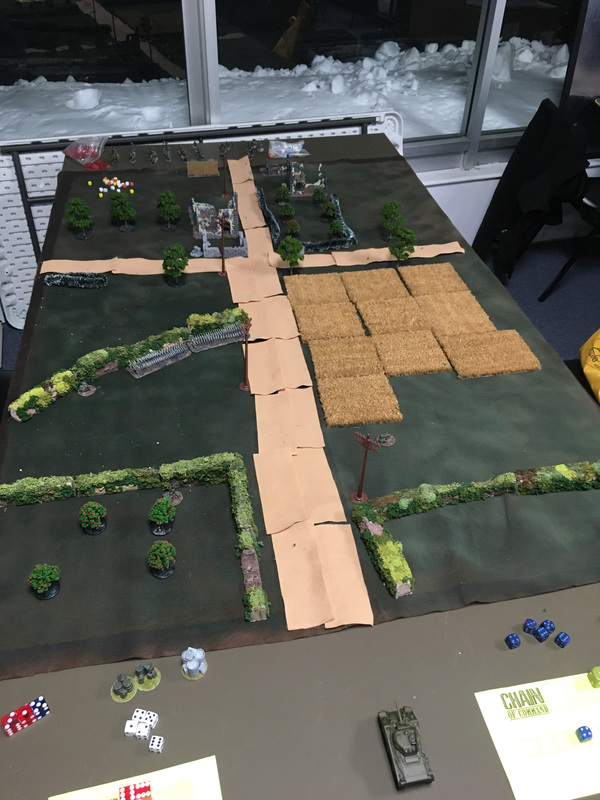 I put a jump off point in an orchard, a small walled section and I had to place one farther back next to a house becuase of the rules for the scenario. Dan had one in the field, one in an orchard at the edge of his table and one behind a long row of hedges. 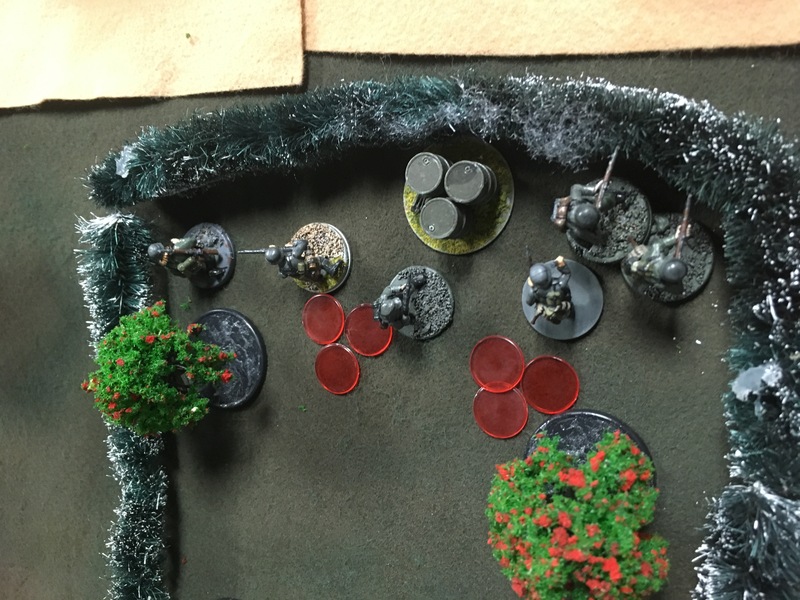 I was able to lock his patrol markers down and force him to put the jump off point almost at the edge of the table. This was my plan since I had two barbed wire sections to put down on the side of the hedge near the road, stopping him from hammering away at the MG42 in the walled in section at close range. It paid off since the machine gun team pretty much held that side of the table. Click on the photos to enlarge them. Dan got a double activation right off the bat. This allowed him to deploy almost his entire platoon onto the table. Unfortunately they had nothing to shoot at! He held back his Sherman and forgot about a second .30 cal team for the rest of the game. Dan’s mortar team fired often but never caused a casualty. I guess it evens out my sniper being all but useless, causing a single casualty. 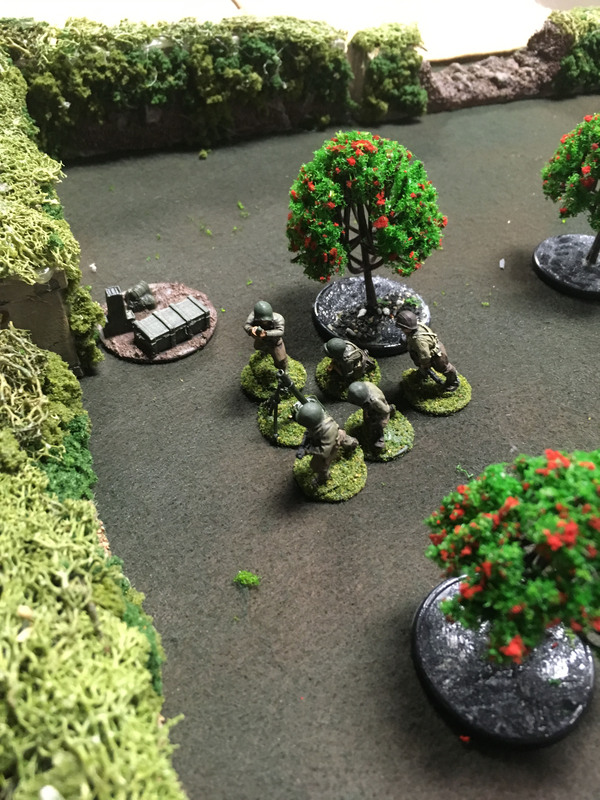 I had a good activation and deployed the machine gun team and one squad into the orchard. This squad would wind up holding off the Americans on that side of the board all game with fantastic rolls, 6-8 hits per phase stacking the shock and casualties. Lots of letters home to mom because of the MG42 there. 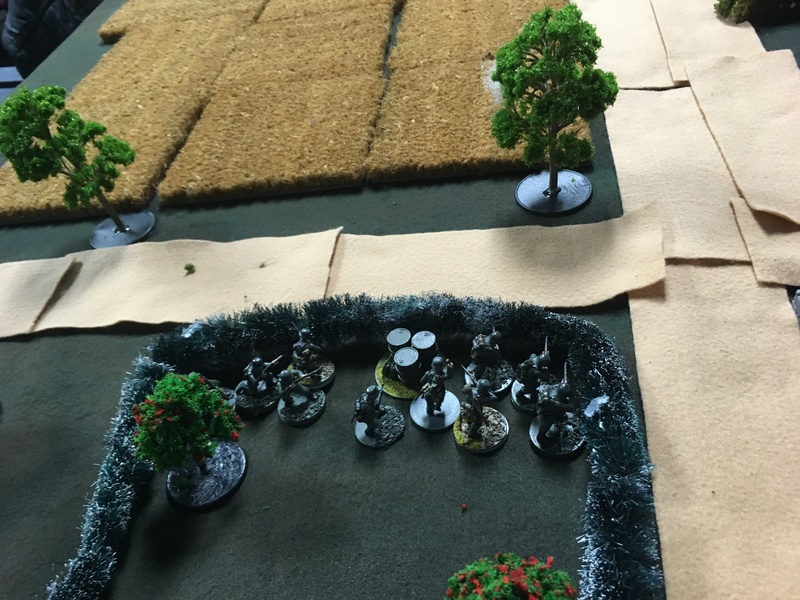 Dan had deployed a squad on the hedges which exchanged fire with my MG42 team behind the stone wall. The hard cover was working to my advantage and he decided he needed to rush the wall and kill my men. On a double activation he hopped the wall and moved forward, firing at close range. I had been luck all night with my casualty rolls but they were catching up with me. Four shock and a casualty racked up and the team was in danger of being pinned. On my activation I deployed my senior leader to support the machine gun and a squad into the house to reinforce the flank. The senior leader removed some shock and ordered them to return fire. Despite the Americans being in the open I didn’t inflict enough casualties. I decided to use a CoC die to end the turn, giving me the next activation. The senior leader removed the last of the shock and ordered the team to open up again on the American squad in the open. My reinforcing squad was in place and opened up on them too. 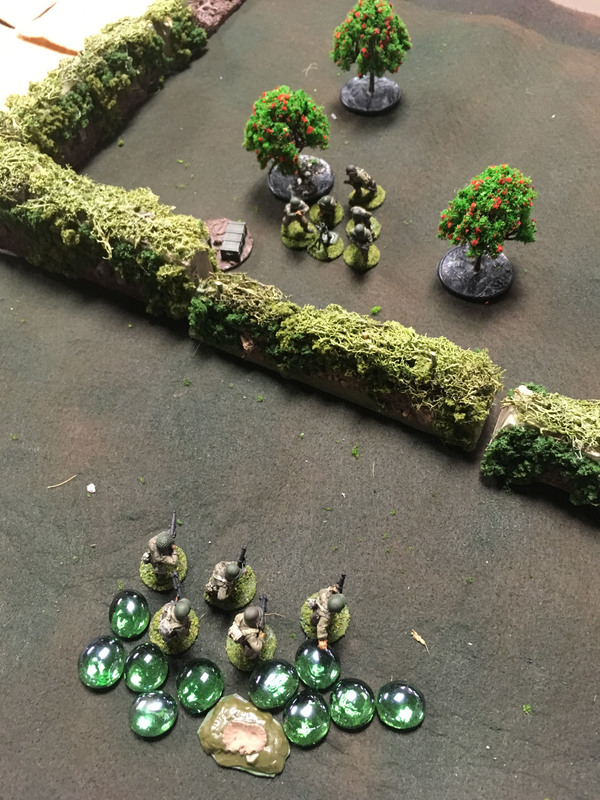 The angles meant that only the MG42 team could get line of sight on them but 10 dice isn’t all that bad and then added to the GI’s bad day. Dan took the next opportunity to jump the squad back over the hedge just after they lost their junior leader. The Americans in the wheat field were not having any better luck. They had stalled once they entered the fields and were trying to trade fire with the German squad in the orchard. 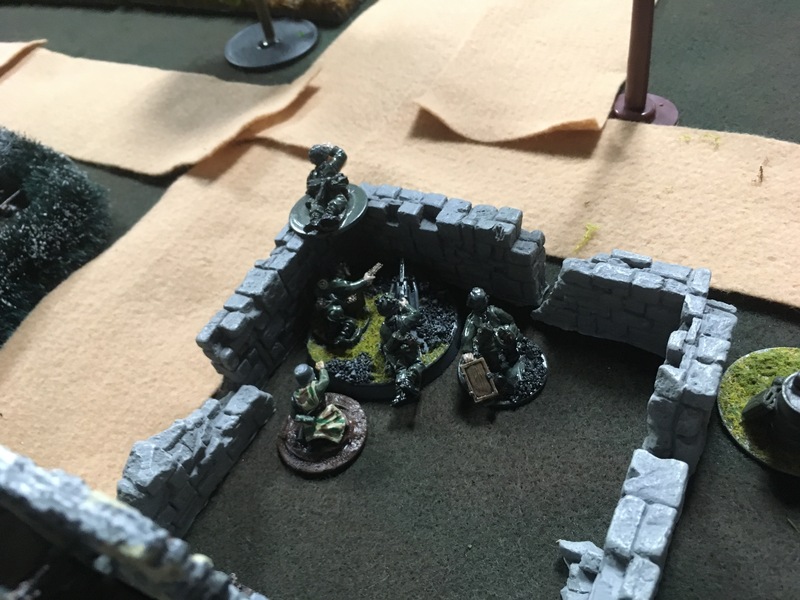 Odds were on the Americans side since they had a squad backed up by a .30 cal team but the dice gods were not on Dan’s side. The German Orchard squad were crack shots. 10-15 dice per turn were resulting in 5-8 hits regularly. Dan was having some luck on the casualty results but it just kept adding up. His return fire wasn’t as effective, either not enough hits or good results on the casualty rolls. I lost a couple men but the shock wasn’t coming quick enough. Repeated activation with the junior leader were keeping them in check. By the time the Sherman was deployed in support Dan had both his Senior leaders supporting that flank. The American infantry squad was whittled down to just one BAR and a couple rifles and the .30 cal was taking hits (although not many pins). It was all he could to do keep the shock down. He did manage to rally them back from a break though, losing the broken team that had failed to assault the stone wall on the other flank in the process. 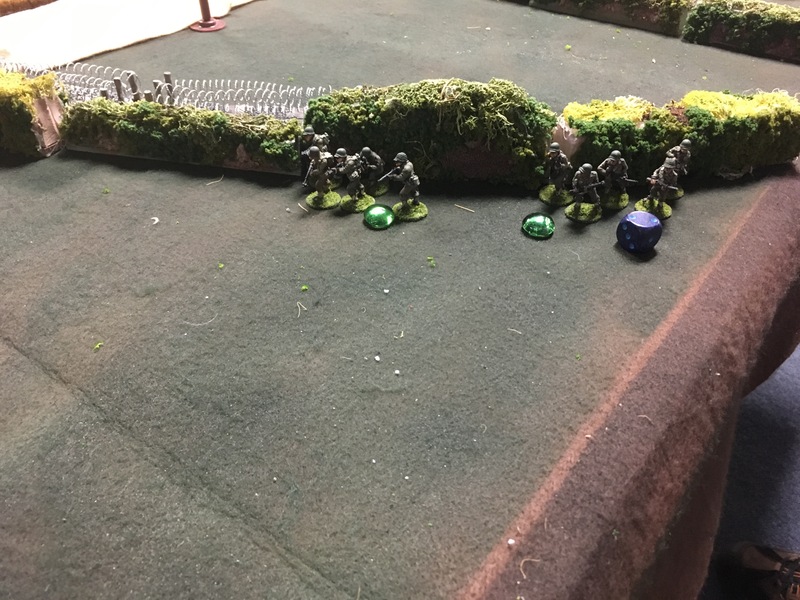 The Sherman and some covering fire from the squad held back in reserve quickly forced the orchard squad into pinned and to broken status, forcing my senior leader to dash across the road and halt their retreat. 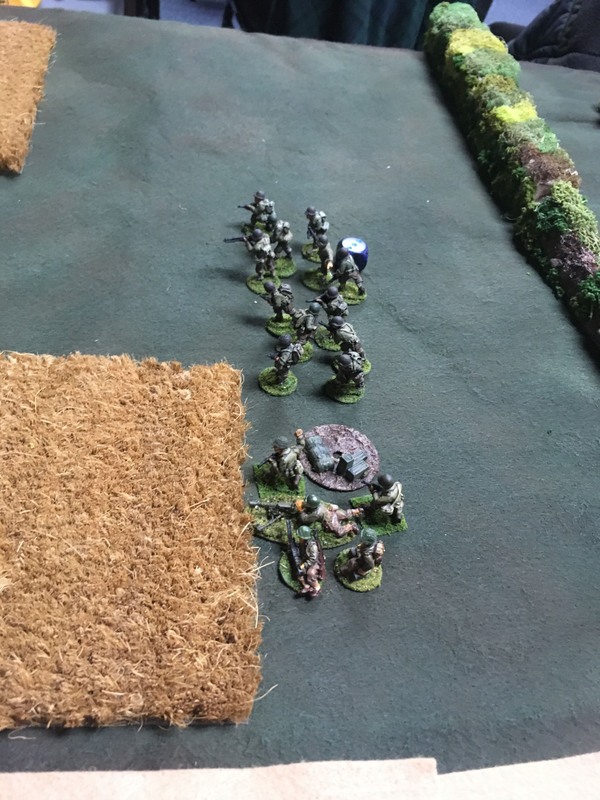 It didn’t matter, the hedge side of the board had collapsed and the Germans were pushing the counter attack. After the Americans had jumped back over the hedge to take cover they quickly were pinned and then broken. As they fled the Germans hopped up and charged the jump off point. Dan had been fairly lucky on his morale rolls, bringing him down a lot slower than I would have liked so I wanted to get the JOP from him. Plus, I have never taken a jump off point before so I wanted to have the glory! I had been holding a squad in reserve, not needing it yet and hadn’t decided where to deploy it. I quickly deployed it and charged it forward. The squad in the house had to run forward, adding shock as they went. Just as the reached the hedge the Sherman came on board and as it crept up it peppered the bushes with machine gun fire, threatening to halt me before I reached the JOP. As the Sherman crept up again for a better shot my Marder’s that were laying in ambush opened up, brewing the tank up and ending the game. I had captured the JOP and destroyed the tank on in the same turn, dropping the force morale to 0 and forcing the retreat. This had been the first game I’ve actually played to completion. Dan had been rolling ok with the morale loss and only lost 2 points once so it was a real challenge to knock him down I think. One more shock on my MG42 and the charge up to the wall would have succeeded I think. 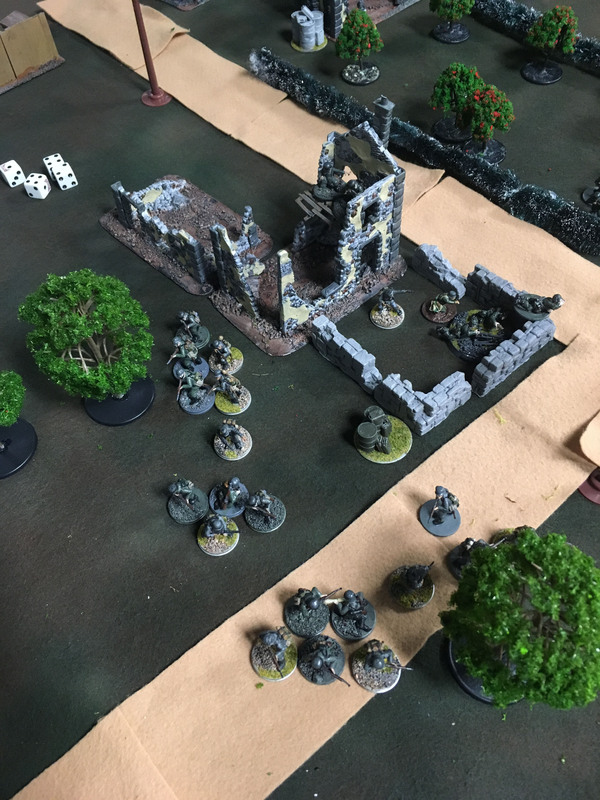 I had three full chain of command dice at that point (having started with two from the scenario) and I was forced to use one to get my senior leader to remove the shock and return fire with the machine gun. He was in a really exposed position and I was afraid that Dan would deploy his senior leader on that flank, rally the section and close in. The machine gun was already down to a 4 man team with two shock and without another activation he could have broken the team. I had a full squad right there and would have immediately engaged him, but that machine gun was essential in holding both flanks. Hindsight is 20/20, I think if Dan had deployed his third squad to the hedges instead of behind the wheat field it would have made a huge difference. I certainly wouldn’t have taken the jump off point. Dan also forgot about one of his .30 cal teams and his mortar was pretty useless. if he had taken two .50 cal teams (they reduce cover) he would have taken the orchard. All of the hedges were only light cover, hammering at the squad there with a .50 cal would have resulted in far more shock and, more importantly casualties and he would have advanced through the fields, forcing me to defend from the house. I need to find my .50 cal teams and paint them up! The Germans have pretty limited support options in this campaign unfortunately. They have no vehicles and no mortars, they can take an infantry gun once, and a Pak38 once. 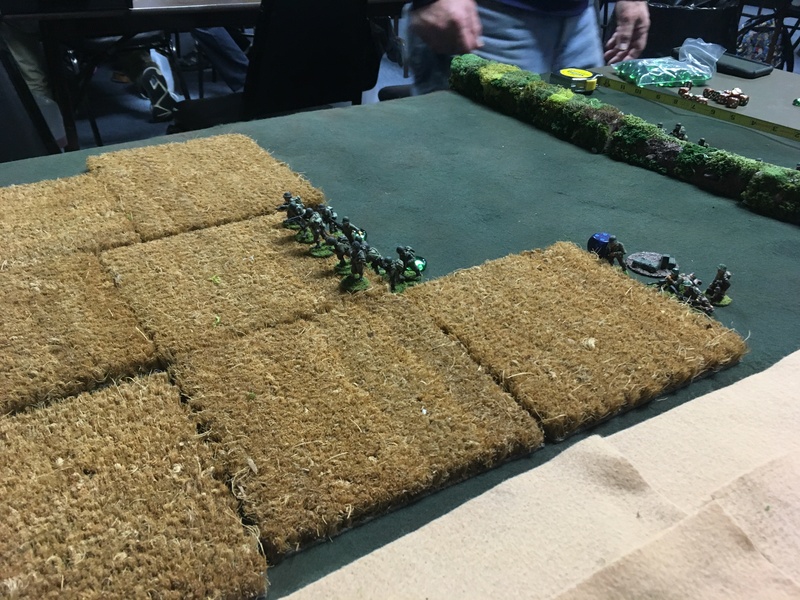 They can take a Pak40 for seven points, a MG42 or a forward observer for four, a sniper team for three points and after this second scenario they can take a squad of green conscript troops but will suffer a penalty to their morale rolls at the beginning of the scenario if they do. The rest of the options are roadblocks, barbed wire, entrenchments, mine fields, medical orderly and an adjutant. Pretty limited combat options. I had meant to bring my Pak40, but forgot. I’m glad I did since the MG42 was essential! The Americans can take (and sometimes HAVE to take) Shermans, both .50 and .30 machine guns, mortars (I’ve never had much luck but they also drop cover by one level when they hit), flame throwers, engineer teams, extra bazookas (to hit what?) and have the option of doubling up on BARs. Obviously the Americans are on the offense and brought everything possible over for the invasion, but it certainly looks pretty lopsided. This is the third game of CoC I’ve played this year and I’m starting to get the hang of it! Previous Previous post: Another week’s worth of work. 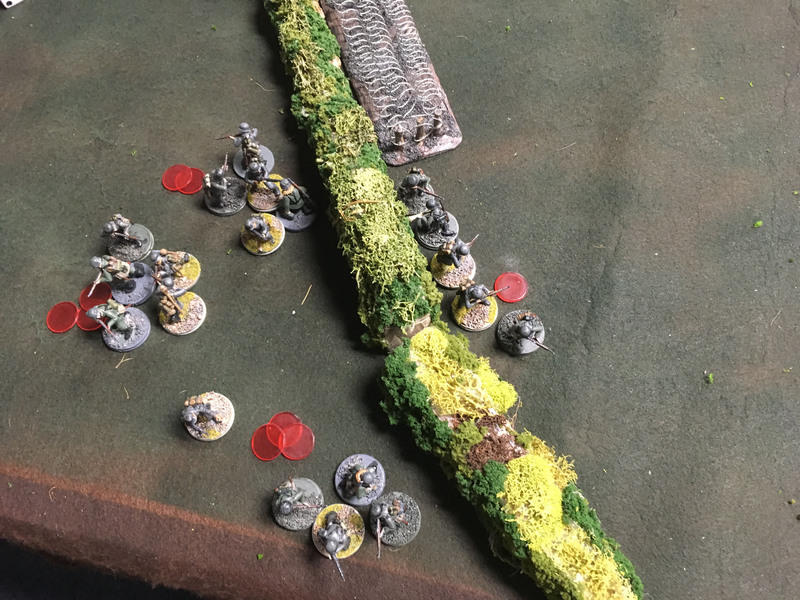 Next Next post: Bolt Action: Key Positions.